Dave and I often visit his family in Gubbio, Italia—the beautiful, medieval hill town of his grandparents. But this year’s visit was extra special. Gubbio is a beloved town throughout Italy, as Italians cherish the story of il Lupo di Gubbio—the notorious wolf, who terrorized the village until tamed by St. Francis of Assisi. 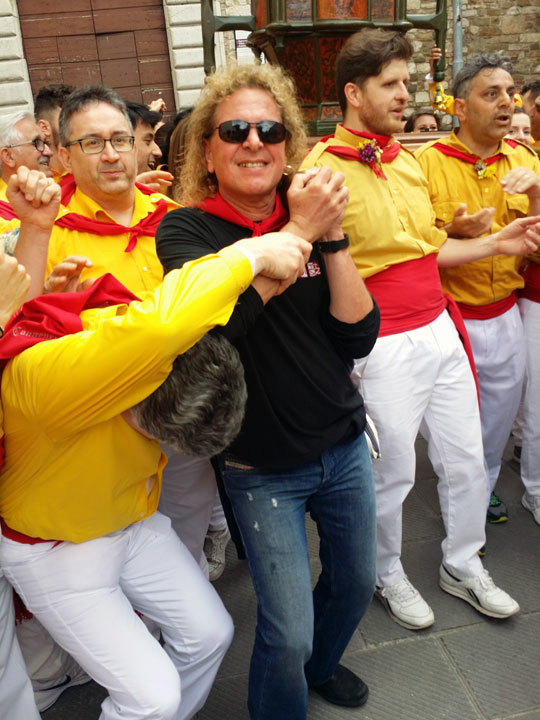 I fondly recall Dave’s dad mentioning the Festa dei Ceri and Sant’Ubaldo. Finally, Dave and I were able to experience this centuries-old event, which happens only one day each year and has roots back to pagan rituals. The festival emotion of the people in this jewel of a town is not easily explained, but is best experienced. 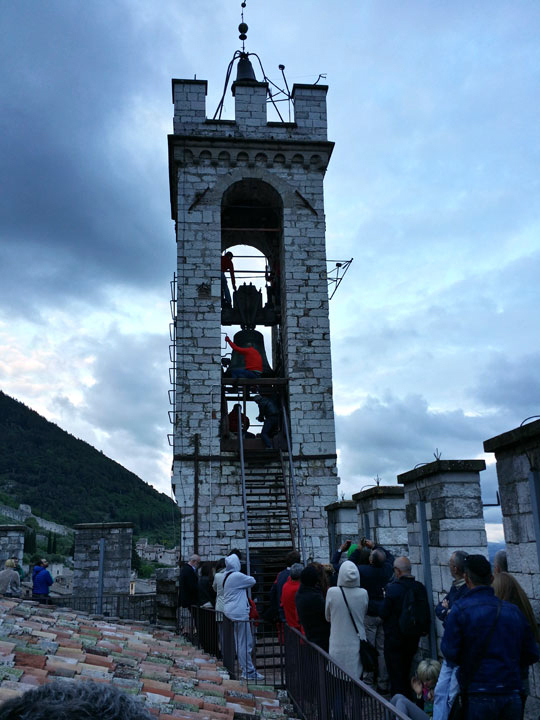 The evening prior, Dave’s cousins treated us to a special bell-ringing, where we were granted permission to watch up at the bell tower. We curved up the many ancient steps to the rooftop of the Palazzo dei Consoli (years ago, I took a pic of Dave on those same steps; it’s his Facebook profile photo). 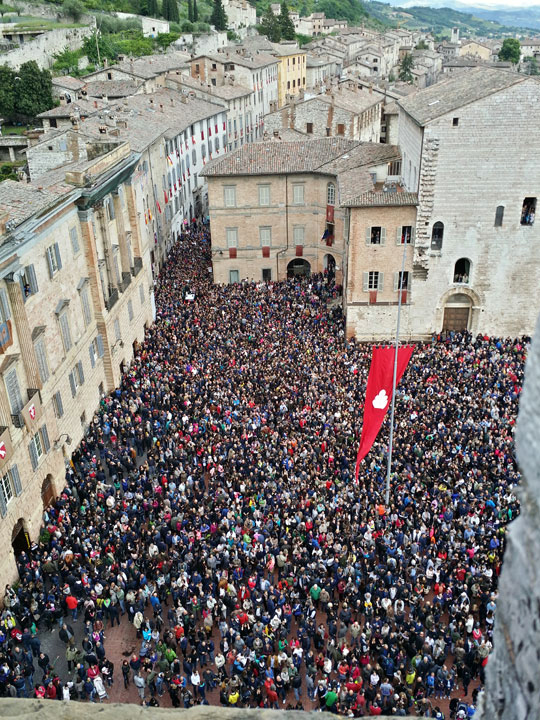 As we waited, we watched people gathering in the piazza below. 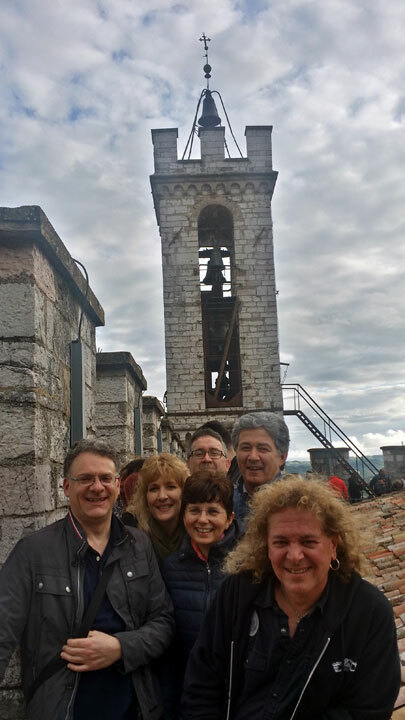 Then the campanari (the master bell ringers) climbed the tower. We marveled at these four men, who used their hands and feet to heave the massive bells into motion, swinging them in melodious tones. After their extended performance, they brought us up into the tower to touch the bells. It was all quite spectacular to us Californians. After the grand bell-ringing, we descended the old, curved stairwell and stepped back into the streets. The whole town buzzed with excitement, and the festival eve celebration lasted well into the night, with lots of singing, wine, and food. We thoroughly enjoyed the local Sagrantino wine—a varietal that we must seek out at home. Our wine highlight: when cousins took us to meet some Y&T fans, who shared their own homemade, young but exceptional Sagrantino. Another Menichetti (the real spelling, which Dave’s grandfather changed when he grew tired of Americans butchering the pronunciation) told us some great stories of how the biggest Y&T fan in town used to call him “Dave Meniketti” when they were growing up—so much so that some people in town thought his real name was Dave! It was fun to see so many fans on this celebratory night stopping Dave (the real Dave Meniketti) on the streets to take a photo with him or just shake his hand. 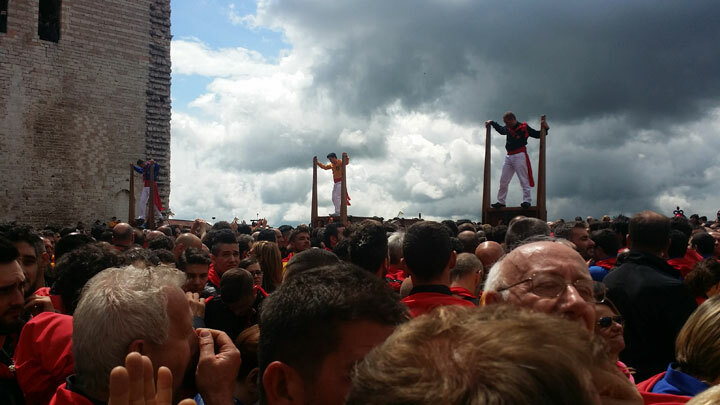 of the Festa dei Ceri. We were now officially part of the event. They led us back to the old town streets to watch the procession. People were feverish for their teams, which are a part of their family history. We followed the family team of Sant’Ubaldo into the grand piazza for the ceremonious start of the event. The piazza was rammed with spectators, and we all stood elbow to elbow. 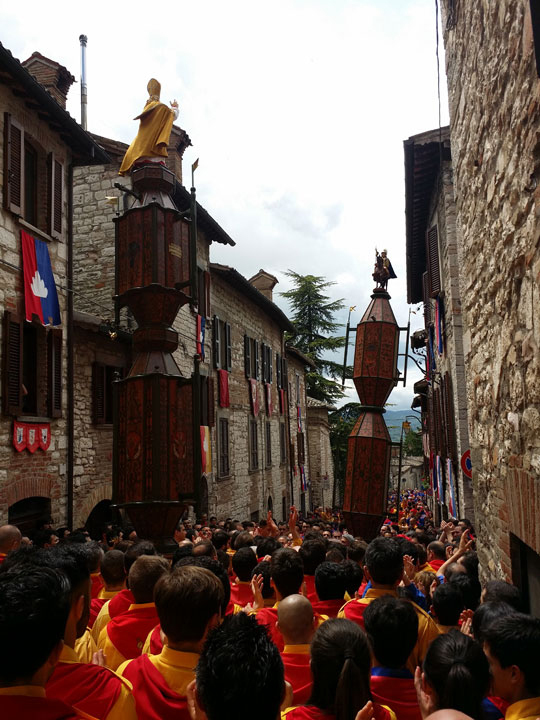 After much pomp and circumstance, the historical details explained by the family surrounding us, the teams raised the massive Ceri, each topped with their team’s respective saint, circled the piazza, and off they went, winding through the ancient streets. It was certainly a sight to behold. The afternoon had brought steady rain, so we returned to the house, changed our clothes, and rested briefly. The TV was on in the background with the event televised live, and Dave spotted us on Italian television! Also, the announcers mentioned Dave, as he was a special guest there for the weekend. Pretty cool! After the closing ceremonies of the day, the Ceri saints were returned for the night to a little church in town, under which we were brought downstairs to see a real treat—the tomb of the wolf! Then, it was back to meandering the ancient streets, stopping here and there for more food and wine. It was phenomenal to experience this centuries-old tradition that was so ingrained in the lives of Dave’s grandparents and ascendants. But words cannot aptly describe our experience. We feel so fortunate that Dave’s lovely family gave us the full experience, emotions and all. This fabulous weekend came to a close the next night as we were formally invited as guests to a very special dinner with the mayor and the two captains from the festival. 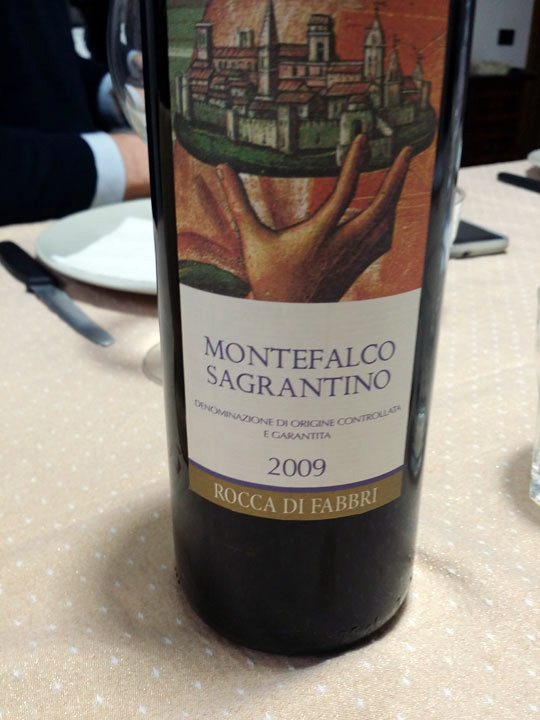 More local wine—Sagrantino (yay!) and Grechetto—and an amazing meal. 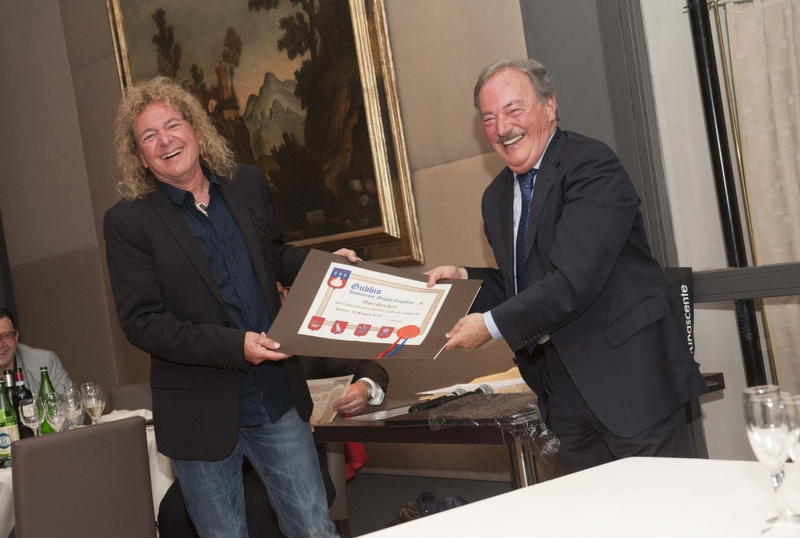 During this special dinner, Dave was presented with two honors from Gubbio. What a wonderful end to three fabulous days. I only wish Dave’s dad and uncles could have been there with us. We’re ever so grateful for the family that remains, and those who contributed to an experience we’ll never forget. Great story and thanks for sharing. Always loved Y&T, still do, always will. Daves playing and their unique sound has etched them in rock and roll forever. Thanks for stopping by to read, Tommy…and for your kind words. Jill….great story, happy for you and Dave , what a incredible experience. I have met you a few times in Phoenix during shows, I have been a life long fan of Y & T……and turned many a friends on to their music. As a lifelong guitar player myself…I am so glad to see Dave and the boys get some renewed recognition. He is my favorite player, so it’s cool things are cruising along nicely. It’s nice they made your two’s visit important…….hoping for new music soon……keep rockin!!!!!!!!!!!! Fabulous account of what was surely an event to remember. Love the old world traditions! Thanks for the photos and as always, a great story. See you on the road. You’re welcome, Rudy. Thanks for reading, and glad you enjoyed it. What a wonderful story, Jill, with the perfect ending! You must be so proud. I’ve been a Y&T fan since 1982 when i saw the boys supporting AC/DC at Birmingham NEC Arena in my UK homeland. I rushed out and bought the Black Tiger LP the very next day! I saw the band again at the Monsters of Rock festival, Castle Donington a couple of years later. I’ve still got the In Rock We Trust t-shirt i bought on the day! Doesn’t fit me any more, though!! For the record, i believe Dave to be one of the best guitar players on the planet. His tone, his vibrato technique and his truly emotional playing make him one of the few guitarists who are instantly recognizable. Also, another reason i was drawn to your post is that i have Italian ancestry too. My Mum is from Foggia in the South. She moved to England with her entire family when she was 9 years old. 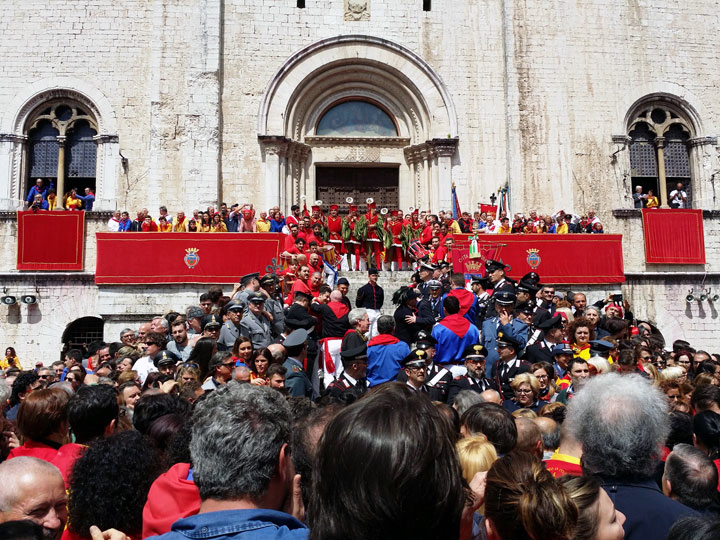 Dave’s ancestral home of Gubbio reminds me very much of Foggia. Anyway, thanks for taking the time to read this. I hope that you both get to enjoy many more trips to the “old country”. I hope you visit your mum’s homeland often. Such beautiful country. Of course, we adore the UK, as well . . . we all look forward to touring there every autumn. What a great honor for you. To see the town gather below you had to be unbelievable. 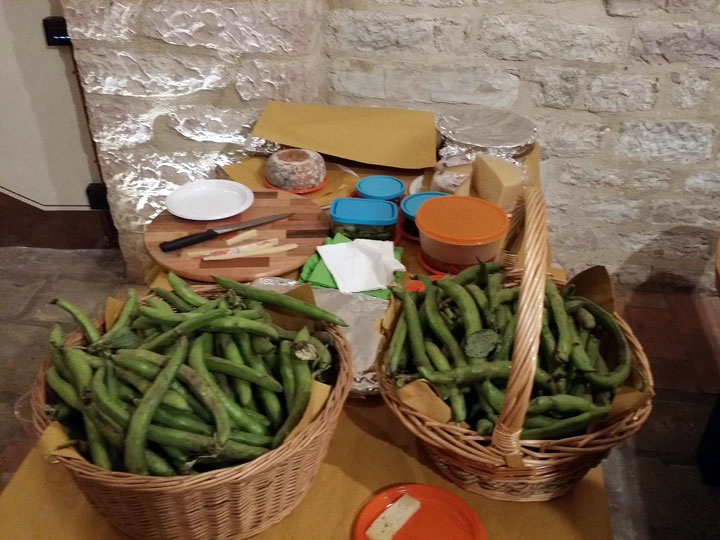 Italian traditions are so wonderful to experience. My family is from Abruzzo. Yeah, watching people gather below for the bell-ringing was very cool. And then being amongst the throngs the next day at the festival was like nothing we’ve ever experienced. I hope you’re able to visit your ancestral home. I cherish our annual visits there. This is so cool! I love family history. Just to be able to walk in the footsteps of our ancestors is a great experience. The celebrations in these little small towns of the world are amazing. Good food, wine and a great time with great people. I agree wholeheartedly, Kenny. 🙂 Thanks for stopping by and giving this post a read. That was very nice. The lifestyle is so nice, especially in the small towns with rich family history. I grew up in Europe in a small town and do miss the traditions. I’m glad you and Dave were able to experience the whole package….see you at a show….. I agree, Sven. There’s a special charm to those small towns. Thanks for dropping by my site and taking a moment to comment. You should! Thanks for stopping by to read, Leticia. That is amazing! I am glad that you both got to experience that. Thank you for sharing this with us…Love!! Ha, you never know! Thanks for reading, David. You should make a point to do it, Mike. It’s a beautiful country. Thanks for stopping by my blog and taking the time to comment.